While this campaign employs some traditional tactics, it is differentiated from other Iranian activity we have seen by leveraging DNS hijacking at scale. The attacker uses this technique for their initial foothold, which can then be exploited in a variety of ways. In this blog post, we detail the three different ways we have seen DNS records be manipulated to enable victim compromises. 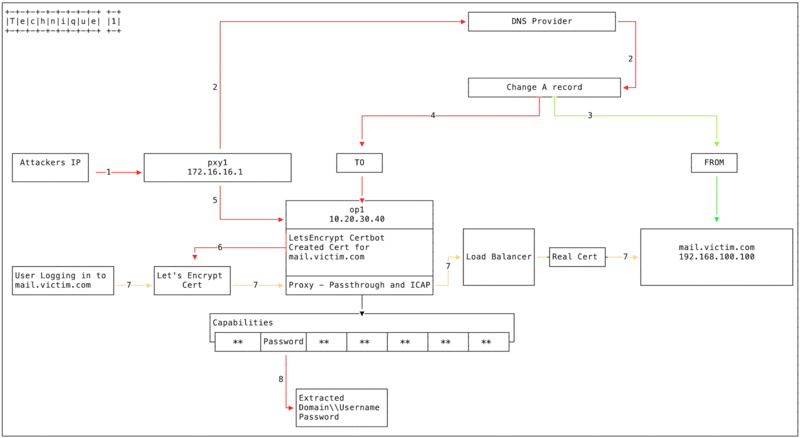 Technique 1, involving the creation of a Let’s Encrypt certificate and changing the A record, was previously documented by Cisco’s TALOS team. The activity described in their blog post is a subset of the activity we have observed. Attribution analysis for this activity is ongoing. While the DNS record manipulations described in this post are noteworthy and sophisticated, they may not be exclusive to a single threat actor as the activity spans disparate timeframes, infrastructure, and service providers. Multiple clusters of this activity have been active from January 2017 to January 2019. There are multiple, nonoverlapping clusters of actor-controlled domains and IPs used in this activity. A wide range of providers were chosen for encryption certificates and VPS hosts. The following examples use victim[. ]com to stand in for the victim domain, and private IP addresses to stand in for the actor controlled IP addresses. The first method exploited by the attacker is altering DNS A Records, as seen in Figure 1. The attacker logs into PXY1, a Proxy box used to conduct non-attributed browsing and as a jumpbox to other infrastructure. The attacker logs into the DNS provider’s administration panel, utilising previously compromised credentials. The A record (e.g. mail[.]victim[. ]com) is currently pointing to 192.168.100.100. The attacker changes the A record and points it to 10.20.30.40 (OP1). The attacker logs in from PXY1 to OP1. A proxy is implemented to listen on all open ports, mirroring mail[.]victim[.]com. A load balancer points to 192.168.100.100 [mail[.]victim[. ]com] to pass through user traffic. We have observed multiple Domain Control Validation providers being utilised as part of this campaign. A user now visits mail[.]victim[. ]com and is directed to OP1. The Let’s Encrypt certificate allows the browsers to establish a connection without any certificate errors as Let’s Encrypt Authority X3 is trusted. The connection is forwarded to the load balancer which establishes the connection with the real mail[.]victim[.]com. The user is not aware of any changes and may only notice a slight delay. The username, password and domain credentials are harvested and stored. The second method exploited by the attacker involved altering DNS NS Records, as seen in Figure 2. The attacker again logs into PXY1. This time, however, the attacker exploits a previously compromised registrar or ccTLD. The nameserver record ns1[.]victim[. ]com is currently set to 192.168.100.200. The attacker changes the NS record and points it to ns1[.]baddomain[. ]com [10.1.2.3]. That nameserver will respond with the IP 10.20.30.40 (OP1) when mail[.]victim[. ]com is requested, but with the original IP 192.168.100.100 if it is www[.]victim[.]com. certbot is used to create a Let’s Encrypt certificate for mail[.]victim[.]com. We have observed multiple Domain Control Validation providers being utilised during this campaign. A user visits mail[.]victim[. ]com and is directed to OP1. The Let’s Encrypt certificate allows browsers to establish a connection without any certificate errors as Let’s Encrypt Authority X3 is trusted. 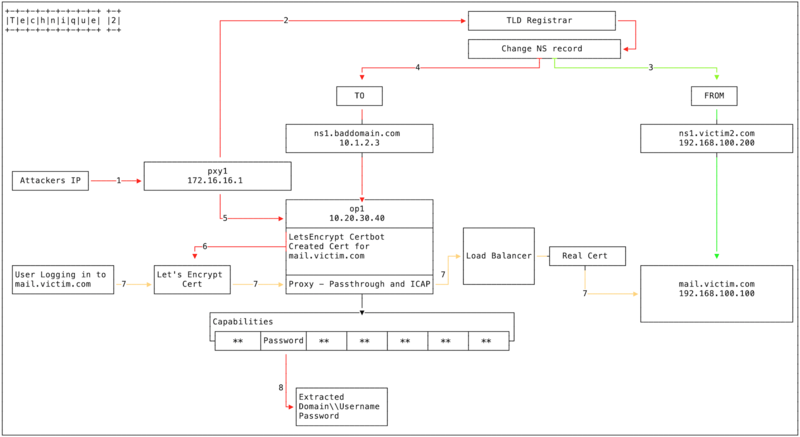 The connection is forwarded to the load balancer which establishes the connection with the real mail[.]victim[.]com. The user is not aware of any changes and may only notice a slight delay. The attacker has also been observed using a third technique in conjunction with either Figure 1 or Figure 2 above. This involves a DNS Redirector, as seen in Figure 3. The DNS Redirector is an attacker operations box which responds to DNS requests. A DNS request for mail[.]victim[. ]com is sent to OP2 (based on previously altered A Record or NS Record). If the domain is part of victim[. ]com zone, OP2 responds with an attacker-controlled IP address, and the user is re-directed to the attacker-controlled infrastructure. If the domain is not part of the victim.com zone (e.g. google[. ]com), OP2 makes a DNS request to a legitimate DNS to get the IP address and the legitimate IP address is returned to the user. A large number of organizations have been affected by this pattern of DNS record manipulation and fraudulent SSL certificates. They include telecoms and ISP providers, internet infrastructure providers, government and sensitive commercial entities. It is difficult to identify a single intrusion vector for each record change, and it is possible that the actor, or actors are using multiple techniques to gain an initial foothold into each of the targets described above. FireEye intelligence customers have received previous reports describing sophisticated phishing attacks used by one actor that also conducts DNS record manipulation. Additionally, while the precise mechanism by which the DNS records were changed is unknown, we believe that at least some records were changed by compromising a victim’s domain registrar account. Implement multi-factor authentication on your domain’s administration portal. Validate A and NS record changes. Search for SSL certificates related to your domain and revoke any malicious certificates. Conduct an internal investigation to assess if attackers gained access to your environment. This DNS hijacking, and the scale at which it has been exploited, showcases the continuing evolution in tactics from Iran-based actors. This is an overview of one set of TTPs that we recently observed affecting multiple entities. We are highlighting it now so that potential targets can take appropriate defensive action.